When did taking time for yourself become ‘being selfish’? Why do people refer to it as out of the ordinary when you decide to do something to take care of yourself? Isn’t that just a natural part of living? This is especially true for parents. If a mom takes up a hobby or sport, she’s “being selfish”. Why is that? Let me tell you, if I weren’t taking care of myself, I wouldn’t have the energy to take care of anyone else. I don’t think that is selfish. It is wise. This is the time of year when people in public are more rude, mean, and in a hurry. It happens all year long, but it is more prevalent when the stores are full and the days are short. The people who assume that whatever their needs are, they are ahead of anyone else surrounding them. The man who carelessly weaves in and out of traffic because he needs to get to his location before anyone else and disregards the safety and comfort of others. The woman who huffs and puffs in the grocery line because SHE is in a hurry and therefore more important than those in front of her in line. Even the person who feels he should police his fellow driver on the road by going under the speed limit to anger the person behind who may be in a hurry to get to an emergency. The people who refuse to accept anything outside of their own opinion or understanding. Why is it common to be selfish in those situations, but label anyone who practices self care to be so? When we take care of ourselves by eating well, resting, praying, and/or finding time for physical exercise, we are giving ourselves the energy to be more positive in our interactions with others. We could also be setting a good example for those who look to us for inspiration. Being selfish is a blatant disregard for other people. Taking care of yourself doesn’t disregard other people. Obviously, I’m not saying that running away from problems and/or people isn’t selfish. If you have obligations in life, those need to be taken care of. Especially if your work affects someone else, you should at least try to do it, but you shouldn’t be ashamed to decline the things you simply cannot do. You shouldn’t be expected to spread yourself too thin to prove your loyalty to a person, job, or organization. If you give all of your life to them, what’s left for you? Give yourself the gift of time to take care of yourself and you’ll find that you’re better able to help others in the process. By being a positive, energetic, and thoughtful individual, you can find more joy in your life. Lose the word ‘selfish’ when you’re describing the time you take for yourself. Don’t let people make you feel guilty for needing time to spend away from work to be with family or away from family to spend on your health and wellness. Sometimes I’m unsure as to whether I should write about something because the story isn’t all mine to tell. Sometimes, I struggle with wanting to put that story down because its powerful and it affects me so deeply that I feel I need to share it to be able to make sense of it. I still haven’t made sense of the past week. I don’t think it will ever come together as something I can understand. Wednesday was the first boot camp style class for me with Winter Warriors, the ten week program I joined to stay accountable for my fitness routine in the miserable months ahead. I brought a minimal number of items in a bag and threw them, and my phone, onto a shelf in the entry of the gym and headed inside for a 30 minute lesson on proper form and the exercises we’d be doing during the core workouts. This meant the typically hated body weight exercises that included burpees, mountain climbers, and push ups. When we were done, I socialized a few moments and went to the car to drive home in the insane wind and drizzling rain. I pulled into the driveway and the family van was not in the garage. I pulled my phone out of my bag and had missed messages, phone calls, and voicemails from the last 45 minutes. I called my husband to hear the words I think I was already expecting from him. “We’re at the hospital. [Our 15 year old child] has tried to overdose on pills. There was an ambulance at the house and I brought the other two kids with me in the van.” The younger two kids are 3 and 5 years old. I closed the garage door and headed to the hospital in my sweaty gym clothes without my purse. I called my best friend. I cried my eyes out while telling her how I was so upset and so angry and I just needed to center. She spoke back to me in a calm and even voice and assured me that my emotions were normal and to go do what I needed to. I arrived at the hospital after having to drive all of the way around it to get to the emergency department. I ran inside and was met by a woman who said that she couldn’t see the names of patients in the rooms, but had a feeling I was looking for room 18. She took me to the room where my oldest lay in a bed in the middle of the room with a box of tissues beside her looking emotionless. My husband then relayed to me she had taken my anti depressant pills from my room and taken them and that the ambulance drivers took the bottle so they could count and estimate how many she’d taken. The nurse came in and confirmed which bottle had been taken and that she’d taken around 30 of my anti depressant pills from a recently filled bottle of 90. The nurse also said that she’d been in touch with poison control and that she’d need to take some charcoal. My husband and smaller kids stayed until after the charcoal was done, but they were getting quite restless (as any young children would). I asked my husband to take them home since I was crying and didn’t want them to see me so upset. During this time, I was checking my phone and one of her friends and the older sister had sent me messages on Facebook telling me that my daughter was saying things about killing herself. Another friend of hers messaged me the same thing. The assistant principal called to tell me that students had reported her saying she was taking pills. Later, I’d check her Snapchat to see that she had posted that she was going to kill herself using pills and that over 200 people had viewed that story on there. 4 people that I know of reported it. I assured the friends that contacted me that they made a good choice and may have saved the life of a friend. Quick thinking and reporting made a huge difference in this case. I’d also sent a few messages out to people for support. One person, though she has a very young child and is probably very busy offered to bring me my things that I’d left at home and found myself needing during my wait. Another person, a runner friend who has been in similar circumstances offered that I was running mile 9 and that I’d make it to mile 10. She was right. I just didn’t feel like running that mile at the time, but I also have never felt like it when I was out running on the trail. I sat in the chair for about 12 hours crying off and on. Sometimes, uncontrollably sobbing and trying to hide behind tissues or even my shirt pulled over my face. I watched people come in from the rigs on stretchers with their eyes closed and wondered if they were going to make it through the night. I had security watch my daughter while I went home and put on clothes that were more appropriate for the cold and windy weather that had settled upon the area in the past few hours. I picked up my Kindle and my phone charger from my house and briefly talked to my husband. I went back to the hospital and read an entire book while sitting in the chair across the room from my daughter, who was in an out of sleep, with a rapid pulse the entire time. Around 3am, a woman entered the room who looked so much like my friend Kate that I was instantly relieved to see her. She was from the county crisis team. My daughter asked to be alone with her, so I went out to the waiting room where a janitor gave me a blanket to keep me warm from the doors being forced open by the strong winds. I then talked to the crisis person myself. We arranged to have my daughter sent to a facility for mental health. A few hours later, an ambulance showed up and took her on the drive to a larger town’s hospital that offers adolescent mental health care. I went home to sleep. In the days since then, I’ve cleaned her room from top to bottom looking for anything she could hurt herself with upon her return. I’ve moved all prescription and OTC drugs into my bedroom closet and added a lock to my closet door. I’ve found an empty pain killer bottle in her closet that I hadn’t even realized was gone until I saw it. I’ve cried a lot. I’ve had conflicts with my husband that I don’t think we’d have if we weren’t under so much stress. I haven’t been out to run or even in my workout clothes. I’ve slept more than I usually would. I’ve talked to some of my daughter’s friends and even one of her teachers that lives a few houses away. He brought me her work from the school office to help out. Apparently, in all the things going on while my husband was home and I was gone, a parent of one of her friends knocked on the door to tell him what was happening. When he tried to get her into the van to go to the hospital, she screamed that she wanted to die. My 3 year old has asked twice if her sister is dead. Once in the middle of the night after waking from a dream. This was unexpected. It wasn’t out of the blue. A few weeks ago, the school called to tell us that she was threatening to overdose on pills. Crisis team was brought in for that, too. They made a safety plan with her. We made emergency appointments with a therapist and psychiatrist. We made her leave her bedroom door open so we could supervise her. The master bedroom was locked and we carried keys around with us to get in so that she couldn’t have access to prescriptions that were in the room. We were only allowing people to come to our house instead of her going to visit others so that we could supervise what was going on. My daughter is due to come home tomorrow morning. We will have some pretty strict policies in place. She’ll have some new coping tools. We will all have to heal from this and figure out how to move forward. I don’t share this to ask for anything. I know that mental illness comes with a stigma that society still isn’t finished with placing on the people who suffer. I also know that unless you’ve actually been in the same exact position, you cannot say what you would do or how you would handle this. I’ve spoken to and visited my daughter. I don’t think she would have wanted me to write this, but I think that it can help. Especially with people who may have gone through this quietly. I’ve found some comfort in telling myself that the only way you get through life is forward because that’s the direction it goes. Things don’t pause when you need them to and they don’t slow down when you want them to. There are always going to be times where we wish things would just be different, but the only way to change them is to keep moving forward and get through and past it. So, I’m going to make it to mile 10. It just won’t be easy. Hello, all! I’ve been away awhile. I think rest is an important part of being fit, but I also had some things going on that kept me from my usual workouts. My husband and I went to Hawaii on our first real trip together since our honeymoon. Before Hawaii, the furthest west I’d been was Omaha, NE. I don’t even remember much about that trip because I was probably 8 years old at the time. So, we went to Hawaii for something that my husband did through work. We stayed on Oahu in Honolulu. While I brought my running clothes, I donned them for the hikes we went on during the trip. We spent a little time on the beach, but the best parts of the trip was spent out on walks or hikes. 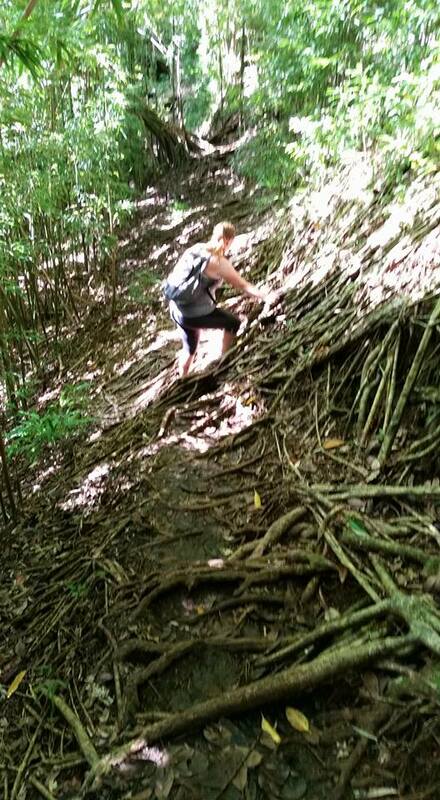 My favorite part was hiking on the Aihualama Trail. We got muddy and we were on a path less traveled in the rainforest. The day we went, it wasn’t raining. 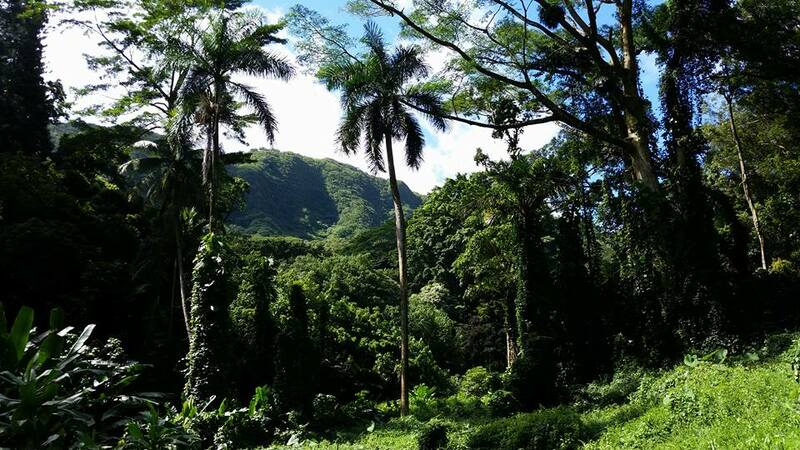 The guides who drove us to see Manoa Falls assured us that was not an average day. Aihualama Trail. I’m almost horizontal trying to get across these roots on the trail. The trip was good for my husband and I to spend time together without interruption from our kids and with the freedom to do the things we enjoy doing together. When we got back is a bit of a different story. We immediately started having trouble with one of our kids that I don’t think it proper to go into because we’re still dealing with it at this time and I don’t see an end to it any time soon. Just know that we have a teenager and teens do things that make you wonder how people make it past those years. I finally made it to a fun run this last Monday night. The last time I’d run before that was October 15th, according to my Garmin history. Of course, my Garmin didn’t turn on at all this time. It felt good to run. I needed to burn off and sweat out the negative energy I’d accumulated. Thursday was the first night of the group I joined called “Winter Warriors.” The group was huge, there was a bit of rain falling, and it was actually a little warm outside. I was glad to get out again and clear my head and chat with other runners. The break was worth it. I got some good walking in for my health. I wasn’t sedentary during my time off. That’s important to note, I think. Breaks from routine are good, but unless you’re injured or ill it’s a good idea to keep active somehow and get in some physical activity. You don’t have to hit the hotel gym on vacation, but taking a walk somewhere you might think of taking a cab might do some good. My stress levels have been high and my eating has leaned into emotional snacking more often. I’ve procured some healthier foods for when I’m feeling the need to shove food in my mouth so that I’m not using fatty food or candy to try to feel better. I’ve managed to maintain my weight, so getting back to healthier habits will hopefully lead to some more loss in the difficult months ahead. The months ahead are difficult for many reasons. The sun isn’t out as long. This leads to feeling a little more depressed and tired. Sometimes, it is harder to squeeze in physical activity outside of the house because the winter weather. I’m hoping the Winter Warriors group makes me feel more accountable for that. Then, there’s just something about being indoors all the time that feels a little sad. I’ve loaded up my Kindle with books, I joined a group that will keep me working out at least twice a week. I plan to attend the fun runs on Monday to add another day of accountability to my winter activity. I’ll try to remember to check in next week after my first boot camp of Winter Warriors. We have Wednesdays for a core workout boot camp and Thursdays are our group runs. So, we shall see if I am feeling optimistic after completing my first core workout of the season. Do you have a plan for the winter months to stay active? Is there a group or class you can join to help you stay physically active? What do you find difficult about the winter months?